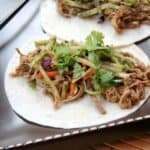 General Tso’s Slow Cooked Pork Tacos with Orange Broccoli Slaw is an easy pork slow cooker recipe combining Mexican and Chinese flavors. 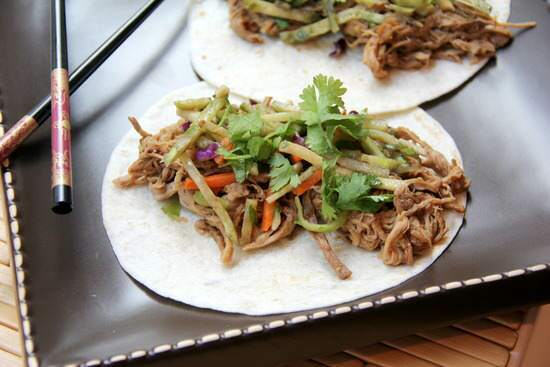 General Tso’s Pork Tacos with Orange Broccoli Slaw, an easy homemade crockpot recipe. One of my favorite dishes at Chinese restaurants is General Tso’s Chicken. If you’re not familiar with General Tso’s chicken, it’s typically made with dark chicken meat that has been battered, deep-fried, and covered in a sweet and spicy saucy and usually served with broccoli. Apparently, the dish also goes by other names such as Governor Tso’s, General Tao’s, General Tsao’s, General Gao’s, or General Gau’s chicken. I’ve always known it as General Tso’s but whatever you want to call it, it’s probably not the healthiest choice by any means (but it does have broccoli so it can’t be THAT bad, right????). Recently, I set out to make a new version of one of my favorite dishes with a bit of a twist for an easy weeknight meal using my slow cooker! I should start off by saying this dish is a TWIST on General Tso’s Chicken. Unfortunately, there’s no good way to make General Tso’s Chicken in a slow cooker since the chicken is typically battered and deep-fried. I wish it was that easy! But this recipe has the same flavors in the sauce and the dish is quite versatile and a lot healthier! You can add as much pork as you can fit in your slow cooker or you could even substitute chicken thighs/legs if you can’t eat pork. I decided to use pork tenderloin because it’s a lean cut and shreds nicely after being in a slow cooker. I thought I’d turn the dish into “tacos” in an effort to get my kids to eat them. Instead of serving the dish with broccoli like many Chinese restaurants, I picked up a few bags of broccoli “slaw” (found by the packaged salads and cabbage slaw at your grocery store). If you’re unsure about the broccoli slaw (it’s definitely not for everyone! ), use shredded cabbage or shredded cole slaw mix instead. You may need to alter the recipe depending on the size of type of slow cooker you have. I added all my sauce ingredients right to my slow cooker and whisked it in there rather than using a bowl. I used Kikkoman less sodium soy sauce and hoisin sauce. They should be at most grocery stores and easy to find. I added two pork tenderloins (total wight was about 2 1/2 pounds) but I coul have easily added twice that. You can cut the pork into pieces if you have a smaller slow cooker. Cook the pork on slow for about 6-8 hours. The pork will be very tender and start falling apart. Remove the pork from the slow cooker and shred it with two forks. It should fall apart very easily and should not take much effort to shred. 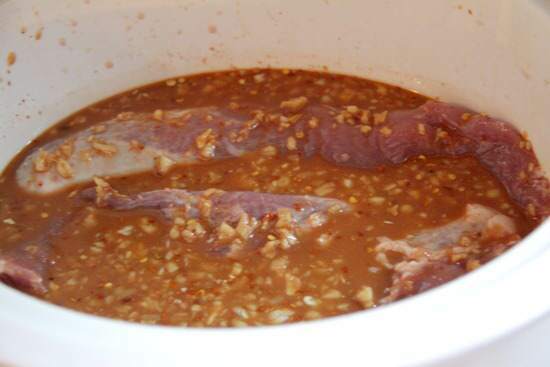 Put the pork in a bowl and mix with some of the sauce from the slow cooker. Or you can add it right back to the slow cooker with the sauce and continue to cook a little longer and keep it warm until ready to serve. For the slaw, mix all the ingredient in a bowl and refrigerate while the pork is cooking. I used broccoli “slaw” but you can use shredded cabbage instead. 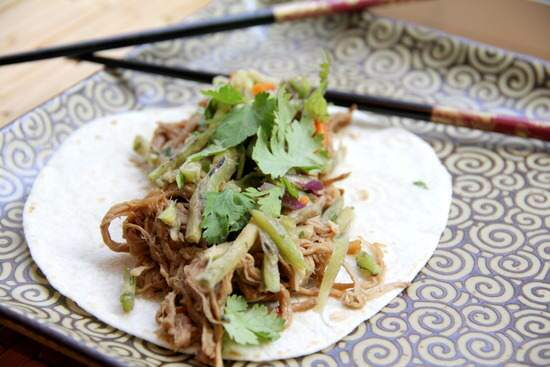 Serve the pork and slaw over tortillas. You don’t really need chopsticks but I tried to make it fun for the kids. You could also serve the pork with rice or noodles instead of tortillas, but we liked the tortillas! Hope you enjoy this General Tso’s Pork Tacos! 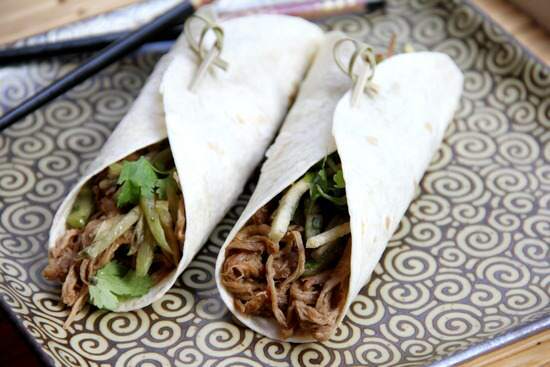 A fun twist on my favorite Chinese dish that is easy to make thanks to a slow cooker! 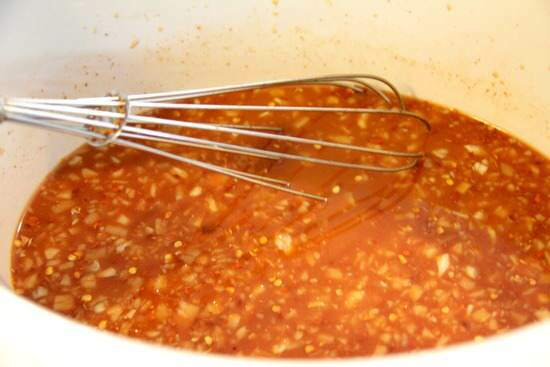 Whisk together broth, hoisin sauce, vinegar, soy sauce, sugar, cornstarch, garlic, ginger, and red pepper in slow cooker until well combined. Add pork to slow cooker and spoon some of sauce over top. Cook on low 6-8 hours. 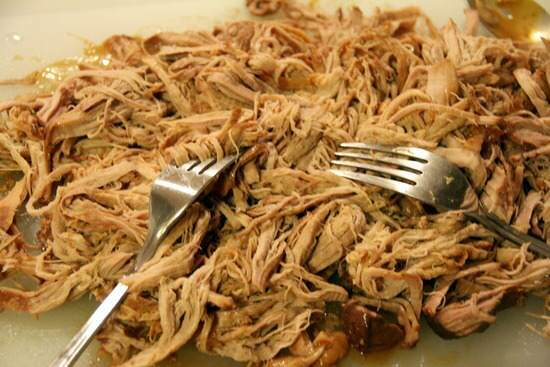 Remove pork from slow cooker and shred with 2 forks. 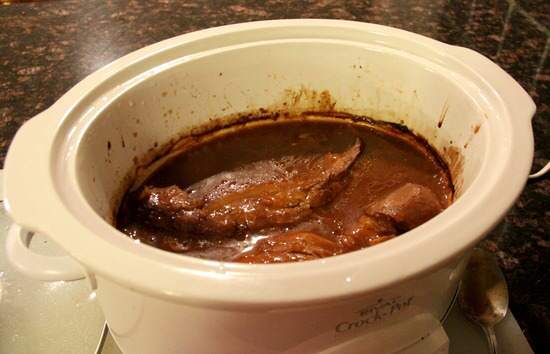 Place pork in serving dish and coat with desired amount of sauce from slow cooker. Meanwhile, while pork is cooking, whisk together orange juice, olive oil, and cilantro in large bowl. Stir in broccoli slaw. Cover and refrigerate until ready to serve. To serve, top tortillas with pulled pork and slaw. SNAPPY TIPS: I would suggest sticking with the reduced sodium soy sauce so that the dish doesn’t taste too salty. You can serve the pork and slaw in tortillas or you can also serve the pork with rice or noodles. SNAPPY SUBSTITUTIONS: You could use chicken legs/thighs instead of the pork. Instead of the broccoli slaw you can substitute shredded cabbage or coleslaw mix. I made this for a dinner party. My guest’s ears were wiggling! It was that good! Everyone asked for the recipe. Thanks! What a great recipe to add to my slow cooker arsenal – Pinned! Brilliant way to get that General Tso flavor without the frying Lisa! I’m a big fan of that dish, too, but it seems like we never go to Chinese anymore – will have to try at home. Can you believe I’ve never tried General Tso’s Chicken? This sounds fantastic and I love that there is minimum prep for the slow cooker! This looks and sounds so delicious! It’s like a combination of all of my family’s favorite dishes in one! Thank you for sharing this recipe, it looks very good and I’d like to try it soon. Since I don’ t live in the States anymore, I don’t have access to all ingredients. Would you kindly explain what the ingredients in a broccoli slaw are, so I can make it myself? I recently threw my slow cooker out because it was US-power and a lot of work to get the converter to stay in place etc, but I definitely want to buy a new one here in Norway – but they are SO expensive here! :( Bought mine in TX for maybe $40, here the large one costs around $200+!!! Hi! Broccoli slaw is shredded broccoli stems and sometimes also has shredded carrots and cabbage. You could substitute a cole slaw mix which would be shredded cabbage and carrots if that is easier. Wow, amazing that slow cookers are so expensive over there!!! They are everywhere here and SO cheap!! Wish I knew someplace over there to suggst to you to buy one! Thanks for visiting my blog! Hope you enjoy the recipe! I know shipping overseas is expensive, but if you look on-line the week after Christmas or in January when all the stores are having inventory sales (home or White sales and discounted discontinued items) you may find a great bargain and it would offset shipping charges. Good luck! Tried this for the first time…AWSOME!!! So easy and delicious, already shared the recipe with others. Highly recommend trying this one. This sounds so delicious. I can’t wait to give it a try. Great! I will make this one day this week. Yum! I have a porkloin, not a tenderloin. Wonder if that would work. Anne, I’m sure a pork loin would work just as well. Just cut it up in a few pieces if you have a smaller slow cooker. Hope you like it! OMG! Cannot wait to try this! My family is gonna freak! General Tsao’s is their favorite and on a tortilla….what a great idea! Love it! Thanks! That recipe sounds so yummy! I can’t wait to try it. What a great recipe! This is my go to order at a Chinese restaurant. But I love the idea of the flavor being on pork. Then serving it as a taco? Sounds amazing!